In the 8 years prior to the lifting of the 1994 Federal Assault Weapons Ban there were 22 episodes of mass murder with guns killing 101 people and injuring 100. In the 8 years after the lifting of the ban there were 26 episodes of mass murder killing 206 and injuring 178. 4 more episodes, 104% increase in deaths and 78% increase in injuries. Surrounded by armed and well trained US military a US Army psychiatrist killed 13 and injured 29 with a pistol and a revolver. Too bad your facts are flawed. All the weapons were locked up in the armory. With the exception of certain job functions/training the military personnel aren't allowed to carry. Once again the numbers are flawed. I know how much you liberals like fuzzy math. Justified shootings (by both police and civilians) are categorized as "homicide by firearm" by the medical examiners. It is up to the courts or prosecutor to decide if said "homicide" was justified. Same goes for suicide, which accounts for the largest number of deaths by firearms and is still listed as "homicide by firearm" even if the homicide is self inflicted. The other numbers that are not broken out into categories is the number of gang shootings. You would have to be insane to think confiscation or gun buy back would have any impact to gang violence. Lastly.......Please tell me where I can find the Canadian's version of the 2nd Amendment. You don't have to like it, but it is, and will remain the law of the land. If life is so good in Canada why don't all the liberals that keep using it as an example of utopia simply move there and leave the rest of us alone? Rob C wrote: In the 8 years prior to the lifting of the 1994 Federal Assault Weapons Ban there were 22 episodes of mass murder with guns killing 101 people and injuring 100. In the 8 years after the lifting of the ban there were 26 episodes of mass murder killing 206 and injuring 178. So are you honestly using some blog to downplay the numbers I posted earlier showing deaths by rifle per year? Why would you think these numbers to be more factual than the ones I posted using the fbi as a source? There are hundreds of kids dieing due to gangs and inner city violence and everyone goes about their daily lives. Some deranged individual shoots and kills 20 kids at a school in an upper class white neighborhood and suddenly a call for action is made. Sadly the only thing I see being proposed by the right is to ban guns. Not one REAL offering has been made about the mental health issue. I will give up my guns as soon as the lawmakers have all their guards give up theirs. The acts at Columbine changed the procedures used by the police in such an event. As I posted earlier, for school security to be successful it would required the trained armed personnel to pose as school personnel. Since you seem to like fuzzy math so much there hasn't been a single US airplane hijacked since the federal air marshal program. That would mean having armed guards on airplanes has completely eliminated terrorist attacks on US soil. A reduction of 100%. I am done with this thread. My intent was to see if the Timberlane School board would be open to such discussion and all I've see is our resident liberal SB member indicate the only thing open to discussion is gun control. This gives me even less faith in the Timberlane SB. If the answers from the SB member posting here are any indication I have my answer and will have no reason to continue the debate and doubling up on my blood pressure meds. I have to run some errands anyways, at least I know my son will have a personal armed guard with him while we go do so. Use out of work/homeless veterans in the schools if school violence is an issue. the violence in schools tend to be in rural areas not inner city where there are armed guards. metal detectors? eastern maine medical center in bangor maine just installed a metal detector. It is not the world of our childhood. Seems like I was wanded by armed folks to enter the Verizon center a year or so ago? Why not schools with trained staff to protect our children? It seems I've created some confusion here. My title was misleading and the numbers represent the total number of murder victims from all causes. These numbers exclude suicides and justifiable homicides. 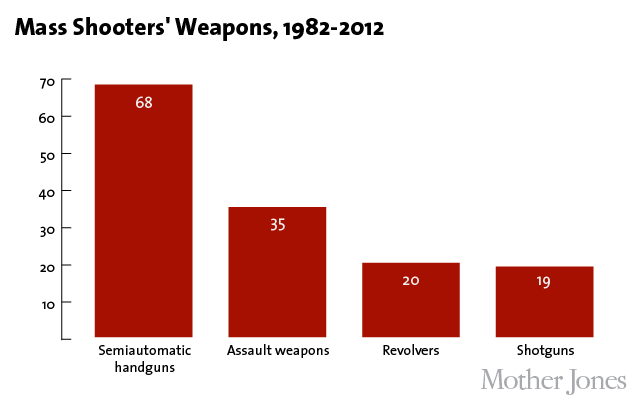 9 times the amount of people 53 times the amount of gun related homicides in 2009. Suicide rates related to firearms would more than double these numbers. SBinRockrimmon wrote: Lastly.......Please tell me where I can find the Canadian's version of the 2nd Amendment. You don't have to like it, but it is, and will remain the law of the land. If life is so good in Canada why don't all the liberals that keep using it as an example of utopia simply move there and leave the rest of us alone? What makes this country great is our ability to disagree, compromise on a solution and move forward peacefully. Asking someone to leave the country who doesn't agree with you, my way or the highway, is not american. Observing and noting the practices of other countries is a healthy practice. At the very least we can grab some good ideas that may work to help our own issues with guns in this country. I found this article that breaks down the mass murders by firearms we've seen over the last 30 years and loosely supports my previous post. The graphic below shows how depending only on rifle homicides doesn't paint any where near the entire picture of how these atrocities are carried out. The majority of them are carried out with guns that are not rifles. Lastly, a poll of 45,000 people was done that compared answers from non gun owners, those who live with a gun owner, gun owners who are not NRA and gun owners who are NRA. The results are below and there is some significant common ground that could be acted upon quickly. Interestingly 7% of NRA members and 36% of gun owners who are not NRA members agree to banning all semi-automatic weapons. The author notes this with the comment that almost all guns sold today are semi-automatic. Coalition to Stop Gun Violence wrote: To date, the National Instant Criminal Background Check System (NICS) has prevented nearly 1.8 million criminals and other prohibited purchasers from buying guns. The law also has a deterrent effect—prohibited purchasers are less likely to try to buy guns when they know comprehensive background check requirements are in place. Unfortunately, current federal law requires criminal background checks only for guns sold through licensed firearm dealers, which account for just 60% of all gun sales in the United States. A loophole in the law allows individuals not “engaged in the business” of selling firearms to sell guns without a license—and without processing any paperwork. That means that two out of every five guns sold in the United States change hands without a background check. Though commonly referred to as the “Gun Show Loophole,” the “private sales” described above include guns sold at gun shows, through classified newspaper ads, the Internet, and between individuals virtually anywhere. Unfortunately, only six states (CA, CO, IL, NY, OR, RI) require universal background checks on all firearm sales at gun shows. Three more states (CT, MD, PA) require background checks on all handgun sales made at gun shows. Seven other states (HI, IA, MA, MI, NJ, NC, NE) require purchasers to obtain a permit and undergo a background check before buying a handgun. Florida allows its counties to regulate gun shows by requiring background checks on all firearms purchases at these events. 33 states have taken no action whatsoever to close the Gun Show Loophole. The number one weapon used to murder people successfully is by far a firearm. Yes people die all of the time by accident, disease or poor health. Guns are easily the most effective method of death and mass death. Of all the "killers" listed in the slide only one was specifically designed to kill efficiently and very effectively. 8,583 murders by firearm in 2011. The next closest was murder by knife or cutting instruments at 1,694. An "open carry" gun activist caused a scare in Portland, Maine, on Monday after dozens of residents reported a man walking around with an assault rifle like the one used in the Newtown, Conn., school massacre. Maine allows firearms to be carried openly in public. Police began receiving calls about 11 a.m. and located the unidentified man carrying an AR-15-style semiautomatic rifle along a popular recreation trail that loops around the city's Back Cove. The gun was fitted with a high-capacity magazine. The man "identified himself as an open carry activist who was exercising his Second Amendment rights" under Maine law to openly carry an unloaded firearm in public, according to a police news release. Police said he was not violating any laws or ordinances. The Portland Press Herald writes that the man "recorded his conversation with police, who made sure the man knew the law before letting him go about his business." Officers gave the area "heavy special attention" until about 2:30 p.m., when the man left. Between 11 a.m. and about 2:30 p.m., police received about 65 calls about a man with a gun walking around the West End and Back Cove areas. In June, Portland police twice stopped and questioned a man spotted carrying a gun. The man, later identified as a law student, took video of the interactions and posted them on YouTube. The Press Herald says that for the past two years, open carry activists periodically have walked around with weapons and record their interactions with police. In 2010, the city council tried unsuccessfully to ban guns from public facilities. Maine prevents cities and counties from enacting gun regulations that are stricter than state law. How is this story from ME relevant to the topic? All I see is a lot of resources (personnel, time, money) wasted on one person that was not violating any laws.